We’re in the middle of October, and we’ve had a blast of cool air. This has made for some awesome late salmon fishing. We’ve had some cold nights and good rains. With the combination of rain and north wind we’ve actually had some very late pushes of king and coho salmon. It has lead into some spectacular steelhead fishing. We’re starting to see a few good numbers in the lower portion of each river system. We’ve been doing well fishing beads and spawn, but we’ve also had good success with clients fishing fly gear. It’s a good time for everybody to get out and take advantage of some awesome brown trout and fall steelhead opportunities, and enjoy the awesome fall color in the tremendous fishery we have in northern Michigan. 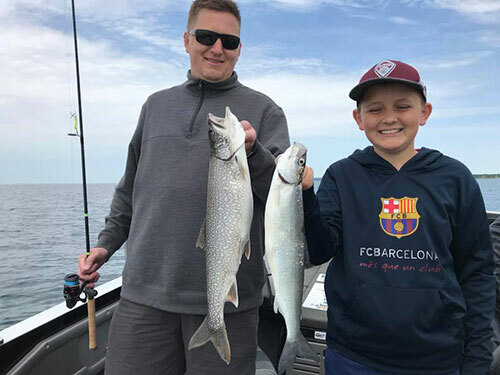 We at Sport Fish Michigan have been eagerly awaiting the arrival of summer, and with July upon us, it is finally time for some consistently warm weather and great fishing opportunities. With the warming weather trends in June we are seeing the start of a very defined thermocline in the Grand Traverse Bay’s, forcing the majority of the lake trout, cisco and other predatory species away from the shallow water flats and steep breaks where they have spent most of May and June. This is an exciting time for anglers looking to vertical jig for a variety of species. Some of the best lake trout jigging in July will take place in depths ranging from 80-110 ft of water. Finding isolated humps and steep drop offs just adjacent to deep water is almost always the most productive place to concentrate your efforts. When utilizing your electronics to find active fish, don’t be afraid to set up over 1-3 individual fish marks, some times these can be the most aggressive fish to take advantage of. Jigging spoons such as Jonah Jiggs, PLine Jigs and Swedish Pimples in a 1-2 ounce size are a great option for this presentation. With the southern end of Lake Michigan experiencing such great numbers of king and coho, July is setting up to be an incredible time to take advantage of some good salmon action in the northern Lake Michigan ports. Anglers looking to either troll or jig vertically for these hard fighting fish should definitely not miss out on the opportunity. Success will be found in areas with a define thermocline that periodically presents schools of bait fish. With the moderately cooler Lake Michigan water temperatures we have experienced in May and June, most of the active salmon will be found 60-120 ft down depending on the port and wind direction. We are very excited to see such great numbers of salmon with a very good average size. Anglers have been consistently reporting fish in mid to upper 20 lbs range. We hope all anglers have a safe and successful July, we hope to see you on the water! Captain Ben Wolfe of Sport Fish Michigan – AnglingBuzzTV fishing report for mid-July, Week 2, 2017. Michigan’s King Salmon fishing is heating up, tips for fishing for brown trout, and summertime smallmouth bass. September’s fishing in northern Michigan is usually incredible, and this year should be no exception. With lots to fish for, the opportunities abound for anglers wanting to target a variety of species using multiple techniques. Most attention this time of year is on the mighty salmon, and this is the prime time to target them! Out on Grand Traverse and Platte Bays, salmon and lake trout fishing are fantastic—a far cry from what it was the last couple of years. Quite a few king salmon are present, and they are running as true adults should-in the 20-25 pound range! Coho salmon are also present, and these silver salmon are a very respectable 8-9 pounds. There aren’t huge numbers like in years long past, but enough to have people once again excited to get out to target king and coho salmon. Trolling early in the day and later at dusk is the best option to get the most out of willing king salmon. Spoons and plugs are great options as are meat-rigs behind a flasher. Flies and smaller plugs are a great way to target the coho salmon on both Grand Traverse and Platte Bays. For those wanting to vertical jig, early morning or right at dusk is prime time for king salmon using 2-3 ounce jigs like a Jonah Jig. For coho jigging out on Platte Bay, the middle of the day can also be productive, and Sport Fish Michigan captains prefer slightly smaller 1.5 or 2-ounce jigs to trigger biters. Platte Bay in September can be a truly world-class place to target coho salmon in shallow water using light tackle. Spinners retrieved at a medium speed can lead to some awesome action, and Platte Bay is the place to do this. This is an absolute favorite way for several Sport Fish Michigan captains to fish in open water for these silver salmon. A 7 to 9-foot rod will help not only make long casts but will also help to cushion these fish when they run, jump and charge under the boat! Targeting salmon is incredibly fun, and with many anglers out plying the waters, showing a little patience with other anglers is critical. We are all out trying to have fun and catch some fish. A little common sense and some etiquette will go along way to helping us all have fun while we’re on the water. Stay safe, and great fishing! Bass fishing in northern Michigan can be just as incredible as is the scenery in which we fish. With so many lakes to fish, there never seems to be time enough to hit them all! September is a fantastic month to get out to target northern Michigan bronzebacks as they are beginning their fall feed. With daylight hours shortening, the feeding windows are condensed, making for what can feel like a true feeding bonanza by our northern smallmouths. As the northerly fall winds descend upon us, the inland lake waters seem to experience smallmouths coming shallow more quickly than out on Grand Traverse Bays. Many of the inland lakes are great places to not only find calmer waters during the north winds that come with fall, but they are also loaded with quality smallmouth options. Windy points and shallow flats adjacent to weed edges and drop-offs are prime spots to start looking for fish that are moving shallow to feed. As the water temperatures fall throughout September, power fishing options like crankbaits, umbrella rigs and spinnerbaits once again take hold. Drop shots and finesse style fishing is still a mainstay when the weather is warm and calm. Grand Traverse Bays are slow to cool, and many of the bigger smallmouths are still down deep in 30 plus feet. Drop shot rigs are a great way to tempt these fish. As the month progresses, more and more fish will make the push shallow where they will be easier to target using a larger arsenal of techniques. 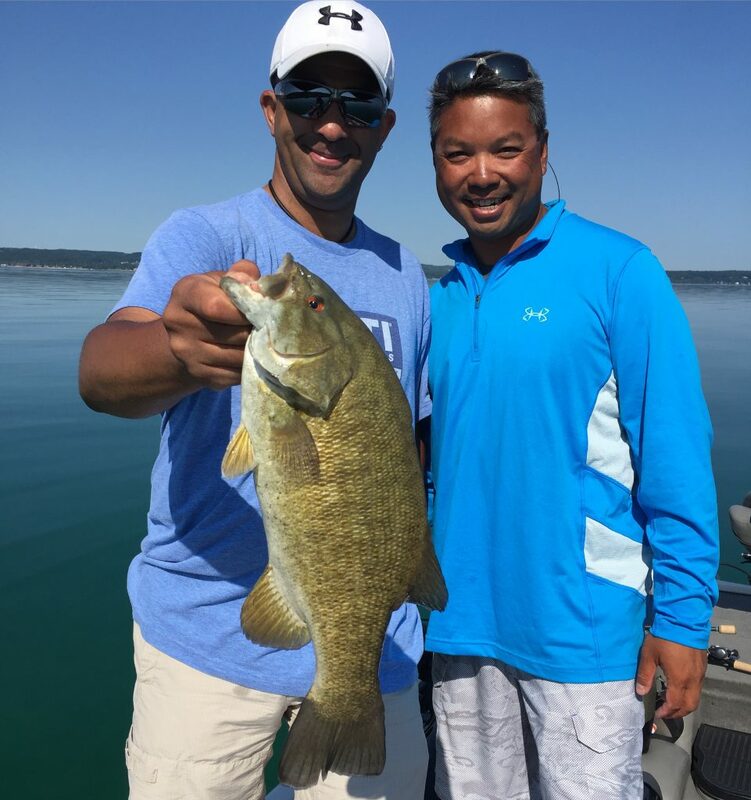 The Traverse City area is known for its amazing smallmouth fishing, and any given day can showcase just why its been so popular with television shows and well-known bass professionals. Stay safe out on the water, have fun, and tight lines! Captain Ben Wolfe with Sport Fish Michigan gives his report for the Michigan area waters for the end of July, 2016. 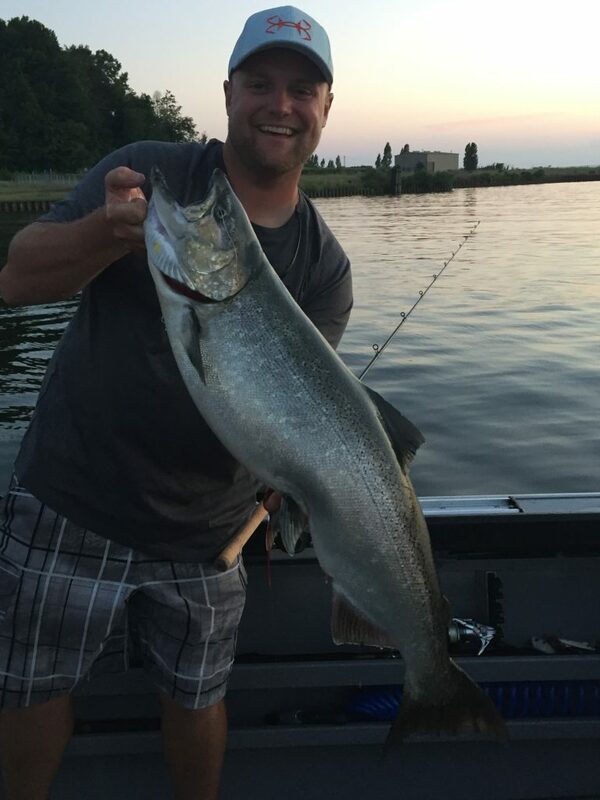 Captain Ben Wolfe with Sport Fish Michigan gives his report for the Michigan area waters for mid July, 2016.